Our Lady came to Fatima to warn that “MAN MUST CEASE OFFENDING GOD.” She called us to make reparation for sin, particularly by means of the daily Rosary, the Five First Saturdays and devotion to Her Immaculate Heart. An egregious offense against Our Lord just occurred in Spain that cries to Heaven for reparation. The outrage occurred in the Spanish city of Pamplona, located in northern Spain near the French border. 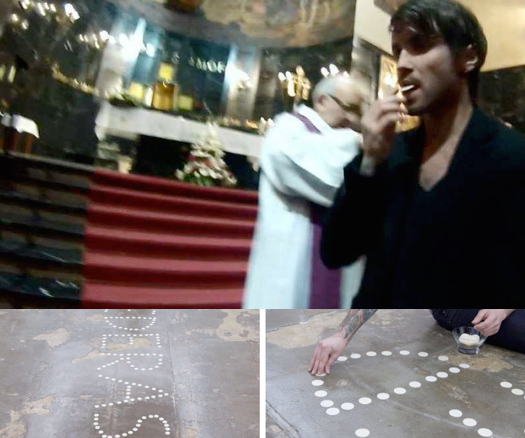 Azcona boasted on his Twitter page, “I attended 242 eucharists (sic) and with the hosts I made the word pederasty.” Azcona also posted pictures of the Hosts on the floor, and his acts of stealing the Hosts, on his Facebook and Twitter profiles (see photos above). A private citizen reacting against the blasphemy removed the Hosts laid out on the ground and took them to a nearby parish. Azcona responded with mockery, noting he still has a chalice full of Hosts he purloined. The Hosts on the floor were never replaced, but the rest of the sacrilegious exhibit remains. The guilt for this heinous event not only falls on Azcona, but on the city of Pamplona itself. "Most Holy Trinity, Father, Son and Holy Spirit, I adore Thee profoundly, I offer Thee the Most Precious Body, Blood, Soul and Divinity of Jesus Christ, present in all the tabernacles of the world, in reparation for the outrages, sacrileges and indifferences by which He is offended. By the Infinite Merits of the Sacred Heart of Jesus and the Immaculate Heart of Mary, I beg the conversion of poor sinners." ..."MY GOD, I believe, I adore, I trust, and I love Thee! I beg pardon for those who do not believe, do not adore, do not trust and do not love Thee." IN ADORATION BEFORE THE BLESSED SACRAMENT. "Most Holy Trinty, I adore You! 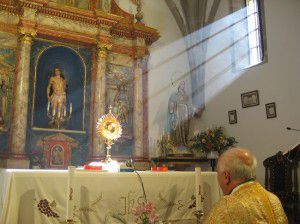 in the Most Blessed Sacrament."